Nobody really knows this but I love making pretty things and sometimes I think that's the life I wanna have when I retire from music - just open up a little shop somewhere, make pottery, sell plants and all the pretty shiny things I make. But we're far from that, I still have a lot of music in me. I recently have been obsessing over cute ring dishes, the tiny ones too tiny to put anything! I thought of getting like a simple ring dish from Etsy to hold all my rings - and then realizing I can make one myself. SO. Tada! Here it is, the 'marble' polymer clay ring dish! It takes a couple of tries to come up with your favourite 'marble' pattern, but it's so much fun and easy to make. By this time, I've learned new ways to step up my polymer ring dish game - I learned how to use gold leaf, debossing letters into the clay using cookie stamps, but lets not rush the learning process here aight let me just show you how to make a clay ring dish like a boss! 1. Cut small pieces from your polymer clay. I chose white, grey, really, really light pink and just a little bit of shocking pink. I want my ring dish to look very marble-y so I avoided choosing bold colours for it. 2. Roll the clay into little strings like this! 3. Hold them together and twist them into this candy-like thing. Don't eat it! 4. Bring one end of your 'candy stick' to the other, and twist again! 5. Roll it up into a ball. Depending on how blended you want you 'marble' to look, you can squish them as much as you like to get the marble pattern you're happy with! 6. Using a roller, flatten out the polymer clay into the thickness that you want. I go for about 0.3-0.5mm thickness. That's pretty thin! 8. Find a flat, round item to help you cut your clay into a circle. You can use a cup, or int his case, my candle lid. 9. Pick a side that you want to be on top of your little dish. 11. Let you platter cool down. To get that glossy finish, I use the Mod Podge gloss/glue and brush it all over the platter. 10. Find a curvy mug or a tiny bowl that is oven-safe. Turn it over and carefully place your clay on top of the base of the mug. Heat it the oven for 15 minutes, at 275 degrees, until your clay is cured. Do not use the microwave to heat up your clay! 12. Apply a coat of gloss and let it dry! 13. The finishing touch! and most probably my favourite part.. Applying gold paint around the edges! 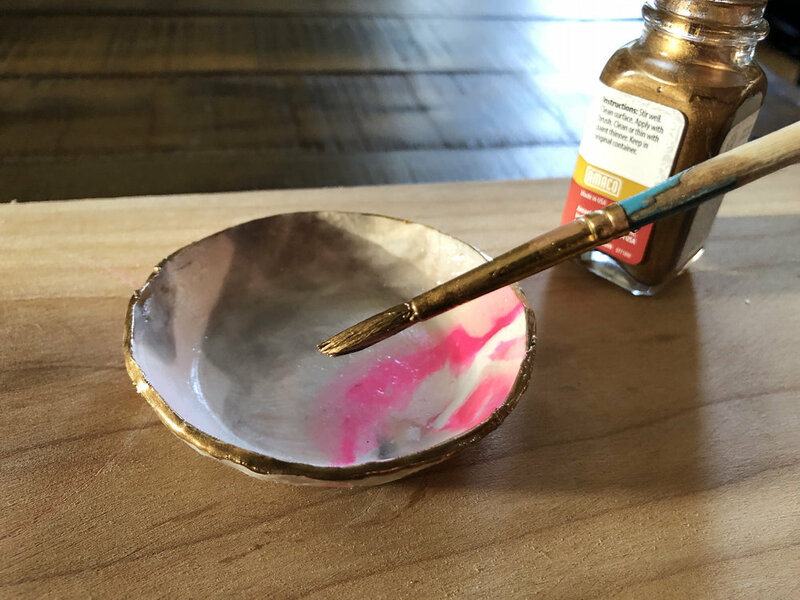 Look for acrylic paint, or even gold nail polish works great too! 14. TADA! Put a bunch of rings in there!